Can fiction change people's minds about climate change? Science and fiction both uncover truths about the world, says debut author Harriet Alida Lye. 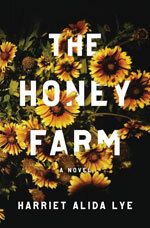 Harriet Alida Lye’s debut, The Honey Farm, is a beautiful and uncanny novel that will leave readers guessing to the end. It takes place on a farm during a drought. The farm’s owner, Cynthia, decides to transform her dried land into an artists’ colony, offering the artists a free stay in exchange for working the land. Among the artists who take her up on the offer are Silvia, a recent graduate and wannabe poet, and Ibrahim, a painter struggling with follow-through. As Silvia and Ibrahim grow closer, they begin to witness strange events on the farm: The water turns an eerie red and frogs take over a nearby pond. Everyone except our two protagonists leave, and Silvia becomes wracked with doubt about who Cynthia really is and whether the environment around her is changing because of climate change or something else. This is a novel as much about how our minds work as the natural world that humanity is wrecking. I interviewed Lye about what inspired The Honey Farm, her hope for the future in the face of climate change, and how the power of fiction can shift our thinking on important issues. Amy Brady: Your book combines so many interesting elements: beekeeping, the effects of drought, the inner workings of an artist colony, obsessive behavior patterns, Biblical references. What inspired this fascinating story? Harriet Alida Lye: Each one of these elements nourished all of the others, which is another way of saying that one thing led to another. It started with the setting and the title. Some friends and I went to a family friend’s farm in the Loire Valley where they keep bees, and someone said “The Honey Farm sounds like a good title for a short story.” I then thought of that quote about “the land of milk and honey,” and when I later looked up the context I found it’s from Exodus, the chapter of the Bible where God sends plagues to the Egyptians. The quote became the epigraph of the novel: “Go up to this land that flows with milk and honey. But I will not travel among you, for you are a stubborn and rebellious people. If I did, I would surely destroy you along the way.” In the Bible, this is obviously an Old Testament God speaking, but I started thinking about what kind of character would say this, and that’s where Cynthia comes from. The inner workings of an artist colony have a lot of resonance with the workings of a hive. People spend a lot of time trying to figure out how bees really work, and how artists really think, but a lot of this is unanswerable. There’s an alchemy that can’t fully be explained, and one of the things that makes Silvia so obsessive is that she believes, or has faith, that she can understand both of those things if she works hard enough at it: nature (or, in her case, nature as a potential stand-in for God) and art. Amy Brady: Our global drop in bee populations has many experts concerned, not only for the bees, but for all living things – because we depend so heavily on the plants they pollinate. Do you think about environmental issues beyond what you write about in your fiction? Harriet Alida Lye: In terms of the declining bee populations and Colony Collapse Disorder, in 2013, Bryan Walsh wrote in Time magazine that bees were perhaps the “canary down the coal-mine” when it comes to climate change. Maybe they were simply the first species to go. But the decline of the honeybees has plateaued and even slightly reverted since then, and as far as I know we aren’t any closer to understanding why this collapse happened, whether our actions since have helped stabilize the problem, or whether nature simply corrected itself. If I think about environmental issues too much I start to lose my mind, and like many people, feel overwhelmed about what I can do and where to begin. Something I take heart in is the conversation between Pangloss and Candide at the end of Voltaire’s Candide, which I studied in university and think of often. It’s easier for me to consider global change in a more intimate setting, and this also translates to fiction, where you can use a character to tell a story that applies to many individuals. Amy Brady: At times The Honey Farm’s Biblical references reminded me of “Revelation.” To my mind, this makes the novel more relevant than ever. In an era of climate change, we’re watching the world as we know it transform so rapidly that some experts are saying we’re headed toward a Revelation-like apocalypse. How did your thinking about climate change influence the writing of this book? Harriet Alida Lye: The novel hinges on whether or not the characters – and the readers – believe that the events in nature are due to climate change or to the wrath of God, as Silvia does throughout. The end, where Silvia realizes that “it was never about God at all … God had nothing to do with it” is an epiphany that will hopefully point readers in the direction of what I intended. Amy Brady: Without giving too much away, let me say that the ending of your book suggests that the future is … uncertain. Given all we know about climate change and various ecological disasters, are you hopeful for the future? Or do you dread it? Harriet Alida Lye: The conclusion of the novel is open-ended, but I’m an optimist (to the point of delusion, sometimes: in a novel I loved that famously ends in a suicide, I was sure that the character walking into the water was just a metaphor for baptism and rebirth). Despite the open-ended nature of my novel, there is a logic to be drawn in which I trust readers will be able to find hope. In terms of the future of the world, well, I don’t think I’d be able to live if it weren’t in hope. Amy Brady: Your lead character, Silvia, expresses doubt throughout the novel: doubt of Ibrahim and Cynthia, the reality of her environment, perhaps even her own sanity. That resonated deeply with me, given the public discourses of skepticism that surround every environmental issue, whether we’re talking about an issue as large and all-encompassing as climate change or as specific as falling bee populations. I’d love for you to discuss your artistic process for coming up with this theme of doubt and how you teased it out. Harriet Alida Lye: Doubt is the flipside of faith, and since the Exodus quote was what started this story for me, the character of Silvia emerged as a girl caught between faith and doubt. She becomes tormented by the struggle between the two, as she gives so much weight to everything. You have to really believe in something in order for doubt to have any serious consequences – I’ve always wondered what it would mean to be a true nihilist, or even an anarchist. Amy Brady: Do you think that fiction about climate change and other environmental issues can teach or show us something that, say, scientific reports can’t? Harriet Alida Lye: I often think about something a writer once told me: For all of people’s predictions about the future – everyone from scientists to science fiction writers – nobody predicted the invention of plastic, which has changed the world more than, let’s say, personal jet-packs would have. I think the same is true for climate change: Our actions leading up to this point have affected our world more than anyone could have predicted during the industrial revolution. Science and fiction both uncover truths about the world – ultimate truths or universal ones – and work to bridge the distance between the known and the unknown. Fiction, through telling personal stories and developing inner characters, can help certain people to see, feel, and embody experiences that they might be unable to empathize with were they to read about them in a scientific report. I also think that fiction writers are able to take greater leaps, perhaps getting closer to reality, by not being bound to fact. One of the next books I’m working on is a kind of science fiction/alternate reality based on the life and work of the Hungarian physicist Leo Szilard, and one of his favorite works of fiction was by H. G. Wells. In the story, Wells predicted the invention of nuclear bombs in 1933. This was the year that Szilard’s discovery of nuclear fission led to the creation of the nuclear bomb. So much happens in synchronicity. The Honey Farm, by Harriet Alida Lye, Liveright, published May 29, 2018. Harriet Alida Lye lives in Toronto with her dog Fox. Her essays have been published in VICE, Hazlitt, the Happy Reader, the National Post, and more. She was a writer-in-residence at Shakespeare & Company in Paris. The Honey Farm is her first novel.